In many cases the savings of performing a rehabilitation on your well and simultaneously replacing an old worn out pump can cut electrical costs by 40-50%. The results of a rehab can not be guaranteed, but should the out come of a rehab be favorable your interests and concerns in the well should not be abandoned. A rehab is an attempt in extending the longevity of a well and is not a “fix all” answer. If you did not have one in place before a regular maintenance/monitoring program should be put in place after a rehab. A regular maintenance program will help you monitor your well and plan a head for when the deteriorating conditions will return, as they likely will. When water production begins to fall in a well, a rehabilitation can be an economic alternative to drilling a new well. A rehab performed by an experienced ground water professional combined with a maintenance/monitoring program may greatly improve the longevity and production of your well. If the production of water begins to diminish there are several steps that can be taken before loosing hope. A Well Rehabilitation can be an effective method of restoring the flow of water. A licensed ground water contractor should review as much information as is available on the well to determine if rehabilitation is an option worth exploring. The perforations in the well casing are opened up by removing the debris that clog them, allowing water to move more freely. Rehabilitation can also remove silt particles from the formation, again allowing water to move more freely. Why a mechanical over chemical rehabilitation? Ron Foster Sr. has been involved in the Ground Water industry for more then 55 years, and through with all those years of experience he has weighed the risks with the outcomes for chemical rehabilitation. We here at Groundwater Pump & Well feel that the potential environmental hazards and cost of chemical rehabilitation do not typically provide enough of a result to make them worth their while. Our experienced crews have had exceptional results with mechanical rehabilitation. Though the results of a rehabilitation can never be guaranteed, with the specialized tools and the experience to use them, the outcome can mean the difference between abandoning the well and years of continued use. What is a typical rehabilitation process? It is important before a rehab in performed to collect as much pertinent information as possible, including Well Logs, Past Video Records, Water Quality, etc., all this information is useful in determining what type of rehabilitation and for how long it should be performed. 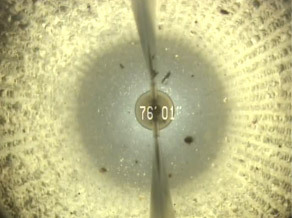 A down hole video is performed in order to view the well casing and perforations and to diagnose any potential problems before the rehab begins. Brushing the well cleans out the debris that overtime have clogged the perforations in the casing. Swabbing the well pulls in silt and debris that lie in the water stratus. During the brushing and swabbing process the debris that have been pulled into the well fall to the bottom, it is then necessary to pull all of that out of the well. A bailer is a specialized tool that allows the removal of the debris. Greater flow of water allowing for less drawdown in the well and/or greater water production. These are before rehabilitation and after rehabilitation photos from local water well. Below are additional tools and methods that Groundwater can utilize during the rehabilitation process. 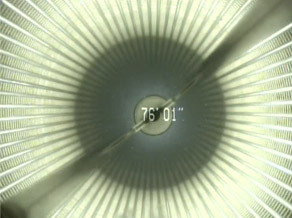 Vib-Clean is a process that uses special detonating cords that loosen materials inside and outside of the well bore. After the process is complete, it is necessary to perform further rehabilitation work to insure all water producing formations have been reconsolidated within the water well. After many years of research, we have developed a Tandem Swab. This was designed and built in our facility, using our expertise in the well rehabilitation industry. The tandem swab allows for a turbulent flow of pumped water to pass around the swabs, causing a high velocity of water passing through the gravel and filter pack, cleaning and re-consolidating the pack. The flow configuration is not the same as normally pumped water wells, since the isolated tandem design concentrates the action in specific areas. This method cleans the screen openings, the outer borehole, and removes fine silts and plugged formations. Groundwater Pump And Well has developed a new well-development method that works better than the old air lift methods, see here. There are several methods involved in repairing water wells, and we take the proper steps to ensure that each is done with meticulous detail. We repair all casing, perform a hydraulic swedge (done in a stainless steel liner over the ruptured casing), and install an inside liner to cover the longest area when the existing casing has deteriorated. When it comes to repairing water wells, no one does it better than Groundwater Pump & Well. Ron Foster Sr has studied groundwater aquifers and re-develop methods around the world, for 55 years and knows the well development and rehabilitation process. Ron Foster Jr has studied Groundwater Aquifers and well rehabilitation techniques for 34 years. Brian Bradford, Field Supervisor, has extensive experience in water well rehabilitation and uses his experience to lead the rehab team.